Today, Mayor Tim Keller joined other leaders across the country by proclaiming January 22, 2019 as “National Day of Racial Healing” in Albuquerque. At a planning meeting with community members today, the City of Albuquerque’s Office of Equity and Inclusion announced it will host a racial healing community event for the public in February as well as begin providing racial equity training to city employees in March. The Office of Equity and Inclusion, headed by Michelle Melendez, marked the National Day of Racial Healing by holding a planning meeting with community leaders to chart the course for anti-racism efforts over the coming year. At the event, the administration announced it will host a racial healing community event open to the public in February. The Mayor has also directed the Office of Equity and Inclusion to provide racial equity training to city employees beginning in March. Follow the conversation on healing using the hashtag #HowWeHeal. 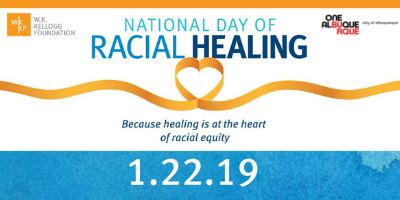 To learn more about the National Day of Racial Healing and resources for how to start a conversation, visit dayofracialhealing.org.